The Anhalter Bahnhof is a former railway terminus in Berlin, Germany, approximately 600 metres (0.5 mi) southeast of Potsdamer Platz. Once one of Berlin's most important railway stations, it was severely damaged in World War II, and finally closed for traffic in 1952, when the GDR-owned Deutsche Reichsbahn rerouted all railway traffic between Berlin and places in the GDR avoiding the West Berlin area. The station's name lives on in the Berlin S-Bahn station of the same name, opened in October 1939 as part of the North-South S-Bahn link. The Anhalter Bahnhof was the Berlin terminus of a line begun on 15 April 1839, opened on 1 July 1841 as far as Jüterbog (the inaugural train being hauled by the very first Borsig locomotive), and extended to Dessau, Köthen and beyond at later dates. Passing through the historical state of Anhalt, it became known as the "Anhalt line" and this in turn gave the Berlin terminus its name. It quickly developed into a network that carried train services to and from Leipzig, Frankfurt am Main and Munich. Like the nearby Potsdamer Bahnhof, the Anhalter Bahnhof started out as a fairly modest affair (behind an imposing administration block, the platform area was a mere 15 m wide), but both would go on to much bigger and better things in later years to cope with growing traffic, the Anhalter Bahnhof destined to be Berlin's biggest and finest station. The front façade faced Askanischer Platz, which was basically a widened section of a street that at that time was known as Hirschelstraße (later Königgrätzer Straße, Stresemannstraße, Saarlandstraße and today back again to Stresemannstraße), then a fairly ramshackle thoroughfare linking Askanischer Platz with Potsdamer Platz (and the Potsdamer Bahnhof), and with Berlin's old customs or excise wall (German: Akzisemauer) running down its centre. At the time of the Anhalter Bahnhof's construction there was no opening in the customs wall at this location, and so one was clearly needed so that travelers could get from city to station and vice versa. And so the Anhalter Gate was created in 1839-40, and bore a strong resemblance to architect Karl Friedrich Schinkel's Potsdam Gate up the road. A new thoroughfare, Anhalter Straße, led from the gate into the city. The Anhalter Gate was one of four extra ones provided in the years after the customs wall's original erection, increasing the total number of gates around the city from 14 to 18. The customs wall eventually became redundant and was demolished in 1866-67, which allowed Hirschelstraße (newly renamed Königgrätzer Straße), to be developed into a proper street for the first time. In 1872, architect Franz Heinrich Schwechten (1841-1924) designed the vast new station that would also be the biggest in Germany and at the time the biggest in Continental Europe, though it was later surpassed. A temporary station was opened in 1874; the old one was demolished in 1875 and the new one begun in 1876. On 15 June 1880, the new terminus was opened by Kaiser Wilhelm I and Chancellor Otto von Bismarck. The new façade was 101 m across and embellished with zinc sculptures titled Day and Night by Ludwig Brunow (1843-1913), positioned on either side of the clock above the main entrance. Emil Hundrieser (1846-1911) was responsible for a sculpture on the very top of the façade called The International Traffic. Inside the building was a lavish and spacious booking hall with separate waiting rooms and facilities for no fewer than four classes of ticket holders. A separate entrance and reception area were provided for visiting royalty, and these saw frequent use. Behind all this, the huge iron and glass train-shed roof by writer and engineer Heinrich Seidel (1842-1906) measured 171 m long by 62 m wide (covering 10,600 m², under which 40,000 people could stand), and rose to 34 m in height along its centre line. The Anhalter Güterbahnhof (goods station), also opened, south of the Landwehr Canal on the same date as the passenger station. Initially the rebuilt terminus was still handling train services mainly to and from Leipzig, Frankfurt am Main and Munich, over the old Anhalter route. However, two years later it inherited a whole new range of services with the closure of the Dresdner Bahnhof. This terminus had opened on 17 June 1875, with trains to Dresden (over the so-called "Dresdener line"), Prague and Vienna, but was small and inconveniently sited some distance from the centre of the city, south of the Landwehr Canal. The Anhalter Bahnhof was more than capable of handling these services as well, and so on 15 October 1882 they were switched, and the Dresdner Bahnhof closed (its building actually still exists, next to the present Gleisdreieck U-Bahn station, having for many years served as part of a major mail-handling facility, itself since closed, called the Postbahnhof). This move was the key to establishing the Anhalter Bahnhof's ultimate importance, as the terminus became Berlin's “Gateway to the South,” with services via Dresden not only to Prague and Vienna, but to places as far away as Rome, Naples and Athens. By 1930, trains left its six platforms every three to five minutes, carrying an average of 44,000 people daily (around 16 million a year, compared with barely 49,000 at Berlin Tempelhof Airport). Though still less busy than the Potsdamer Bahnhof up the road, the Anhalter Bahnhof was superior in its sheer scale, and in the opulence of its train services. Also by this time, the station was connected directly with the hotel which faced it across Askanischer Platz - the Hotel Excelsior, Europe's largest - by means of a tunnel, believed to be the longest of its kind in the world at 100 m, constructed in 1927-1928. There were even five underground shops down there. In 1939 the S-Bahn (German brand name for suburban and city railways) arrived. The idea for a North-South Link transversal rail line connecting the northern suburban lines terminating at Stettiner Bahnhof ("Nordbahnhof" since the early 1950s) with the southern suburban lines terminating at Potsdamer Bahnhof had first been mooted in 1892, ten years after the building east-west transversal line, the Stadtbahn connecting the Charlottenburg station and Berlin Schlesischer Bahnhof, but it was not planned in detail until 1928, and then approval had to wait until 1933, as part of Hitler's public works projects (Arbeitsbeschaffungsmaßnahmen) to pacify workers by reducing the high unemployment. Begun in 1934, it was opened in two phases. First the northern section from Stettiner Bahnhof to Unter den Linden, inaugurated on July 28, 1936, just in time for the Berlin Olympic Games, and then the southern section from Potsdamer Platz via the new underground Anhalter Bahnhof station with the Wannseebahn on October 9, 1939, shortly after World War II began in earnest. The suburban lines to Zossen and Licherfelde-Ost via Papestraße and Priesterweg were connected to the tunnel on November 6, 1939, making the new North-South transversal line complete. This underground station was placed at the west side of the existing overground station. At Anhalter Bahnhof S-Bahn station a direct access route to the mainline terminus above was provided from 19 December 1940. At the S-Bahn station four platforms were provided to receive the Wannseebahn and the trains from the two suburban lines coming from Priesterweg station arriving via their separate tunnel mounds on opposite tracks of the receiving platform, and to provide the same for trains departing in the two directions. The station removed two siding tracks behind its south head. 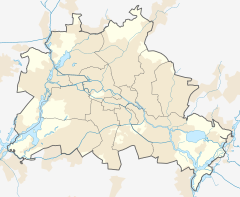 The construction work had to pause for several months in 1937, after Hitler proclaimed his plans for Welthauptstadt (World Capital) Germania on January 30, 1937, with plans for a thorough remodeling of Berlin's railway structure. As one of these plan's several results for the North-South S-Bahn link, the northern end of the station, already largely finished in 1936, had to be rebuilt to accommodate connecting pieces for a new S-Bahn line going the Görlitzer Bahnhof; as a result, track 1, the westernmost track can no longer be used for trains coming from Potsdamer Platz station, but only from the blind connecting piece for that line to be built later. The war and its outcome made all those plans obsolete - the S-Bahn to Görlitzer Bahnhof was never started to build, and the Görlitzer Bahnhof itself is also gone. The fate of the Anhalter Bahnhof was determined by World War II, and yet even if the war had not occurred, major changes would still have taken place. Under Nazi dictator Adolf Hitler's grand plan to transform Berlin into the Welthauptstadt (World Capital) Germania, to be realised by Albert Speer, the building would have ceased to be a railway terminus. The new North-South Axis, the linchpin of the plan, would have severed its approach tracks, leaving the terminus stranded on the wrong side of it. All trains arriving in Berlin would instead have run into either of two vast new stations located on the Ringbahn to the north and south of the centre, to be known as Nordbahnhof (North Station) and Südbahnhof (South Station), located at Wedding and Südkreuz respectively, while in Speer's plan the former Anhalter Bahnhof was earmarked to become a public swimming pool. Ruin of the Anhalter Bahnhof, 1951. When the Berlin Wall was erected on 13 August 1961, it had a profound effect on rail services in and around the city, and on the S-Bahn and U-Bahn in particular. 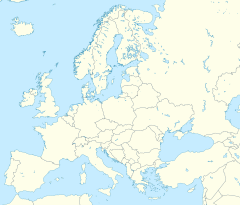 Essentially both were divided into two systems, with lines being physically severed where they crossed the border between East Berlin and West Berlin. In most cases trains on either side would simply run as far as the last stop before the border and then reverse back. The S-Bahn North-South Link saw a more bizarre - though not unique - state of affairs. 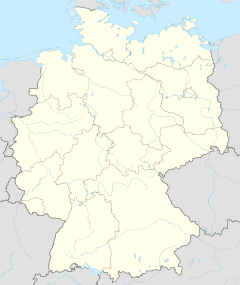 This line, plus two U-Bahn lines elsewhere in the city, suffered from a quirk of geography in that they briefly passed through East German territory en route from one part of West Berlin to another. This gave rise to the infamous "Geisterbahnhöfe" (ghost stations), those unfortunate ones on the eastern side that were sealed off from the outside world and which trains ran straight through without stopping. (One exception was the station Bahnhof Friedrichstraße, where passengers could change trains to the western part of the East-West-S-Bahn and one line of the U-Bahn (today U6). This station also served as a border checkpoint for people entering East Berlin.) Trains would generally slow down, however, affording passengers the strange sight of dusty, dimly lit platforms patrolled by armed guards, there to prevent any East Berliners from trying to escape to the West by train. At the points where the lines passed directly beneath the actual border, concrete "collars" were constructed within the tunnels with just the minimum clearance for trains, to prevent people clinging to the sides or roof of the coaches. Anhalter Bahnhof station itself remained open; being in West Berlin, it was the last stop for northbound trains before they entered the "restricted section", and the first stop for southbound trains after they had left the section. However, of its four platforms just two (sometimes only one) saw regular use, and the station appeared to receive only a minimum of cleaning and maintenance. After the fall of the Wall on 9 November 1989, Anhalter Bahnhof S-Bahn station and all the ghost stations underwent a major refurbishment before being re-opened on 1 March 1992. Today the S-Bahn station remains the only one open at the location, and still called "Anhalter Bahnhof" although it is over half a century since the great terminus aboveground closed. As for the terminus itself, today the centre portion of the façade still looks out over Askanischer Platz, having been restored several times since the demolition of the rest of the building. At the top, Ludwig Brunow's Day and Night sculptures, somewhat the worse for wear, still sat on either side of the now empty clock space until the most recent restoration of the structure in 2003-2004, but to avoid further corrosion they have now been replaced by copies (the originals can be seen in the German Museum of Technology, close by on the south bank of the Landwehr Canal). The photograph on the right shows the façade remnant in 2005. The oddly-shaped white building faintly visible in the distance on the right is the Tempodrom, a major new concert and event venue. Close by stands a memorial display board honouring the Berlin Jews taken from here and elsewhere to their deaths by the Nazis during World War II. The original "Day and Night" sculptures from the façade, photographed in 2003 in their new home, the German Museum of Technology. Day is on the right, gazing into the distance, while Night, on the left, is looking away. This view shows the rear of the façade remnant in 2005. In the left background is Europahaus, an office block dating from the early 1930s, while in the right background is the 18-storey Excelsiorhaus, on the site of the former hotel. It is not known whether the underground tunnel that once linked the station with the hotel still exists. In the foreground is a large new synthetic playing surface for sports where the train shed once stood. Immediately south, directly behind the photographer, is the Tempodrom. The Tempodrom, a major new concert and event venue opened on 8 December 2001, extends across the site of the terminus just south of the train shed's former location. Its innovative futuristic roof rises to a height of 37.5 m.
Further south still, extending down to the Landwehr Canal, is an area of woodland, recently tidied up and new paths laid, but amongst the trees and undergrowth, several crumbling sections of platforms are still clearly visible. This location appeared on many picture postcards in the early years of the 20th century, and in some ways it has not significantly changed since then. The red-painted bridge side-on to the camera is a recent construction for pedestrians and cyclists, approximating in appearance the railway bridge which once crossed at the same spot. The main arch was once the centre span of three of a much older structure located elsewhere in the city - the Marschallbrücke, built by Eduard Albert Paul Gottheiner in 1881-82, which carried Luisenstraße over the River Spree just to the east of the Reichstag. Concerns about its condition, coupled with the need to provide greater clearance for vessels on the river, brought about the replacement of the centre and south spans with one long new span in 1997-99, after which the old centre span was re-erected here as shown, as part of this new bridge designed by Benedict Toon and opened in February 2001. Just beyond it is where the S-Bahn North-South Link runs beneath the canal, and it was here that SS troops blew up the bulkheads in the last days of World War 2, deliberately flooding the tunnel in the hope of slowing the Soviet advance. 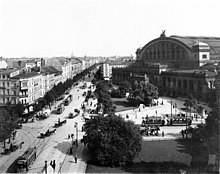 The Anhalter Bahnhof stood out of the picture to the right (north). The buildings in the left background, on the south bank of the canal, house the German Museum of Technology. The other bridge, the higher one crossing the canal at a sharp angle, carries a section of U-Bahn line between Gleisdreieck and Möckernbrücke stations. Out of the picture to the left are surviving parts of the Anhalter Güterbahnhof (Goods Station). Anhalter Bahnhof 2005. The surviving central portion of the façade. Anhalter Bahnhof 2003. The original Day and Night sculptures from the façade. Anhalter Bahnhof 2005. The site of the train shed. Anhalter Bahnhof 2005 - The Tempodrom. Anhalter Bahnhof 2005. Platform remains - one of several sections still visible in the undergrowth. Hand in hand with the passenger terminus, the goods station had also been rebuilt at the same time (and was opened on the same day). Also the work of Franz Heinrich Schwechten, it was located on the south bank of the Landwehr Canal immediately to the east of the parallel passenger lines. This artistic representation is Schwechten's own front elevation, showing the twin administration blocks linked by an attractive bridge structure, with three arches through which road vehicles passed into the so-called "ladestrasse" (loading road), 20 m wide. On either side were covered goods-handling areas some 210 m in length, with the railway sidings on the other side, to enable efficient movement of goods from railway wagons to road vehicles or vice versa. Today the eastern administration block (on the left in the 1874 elevation) is the only one still standing, now restored and today the home of 'Spectrum', the Berlin Science Centre, another part of the German Museum of Technology. Its western twin was badly damaged in World War 2 and was demolished in 1959, the bridge structure following in 1963; the grey rendered area on the side of the building in this picture marks the bridge's erstwhile location. Down the former loading road on the right, the covered goods-handling area is now used mainly by a variety of small industrial concerns. Further down again is a large overgrown area of almost total desolation. Things are however looking much brighter at the adjacent Anhalter locomotive depot to the west, sandwiched between the Anhalter Güterbahnhof and the former Dresdner Bahnhof. After decades of dereliction its buildings have been restored and also incorporated into the German Museum of Technology. Anhalter Güterbahnhof (Goods Station). Architect Franz Schwechten's original elevation from 1874. Note the loading road visible through the arches. Anhalter Güterbahnhof 2005 - part of the overgrown area further south. ^ Thomas Henry Elkins; Burkhard Hofmeister (1988). Berlin The Spatial Structure of a Divided City. Routledge. pp. 115–17. ISBN 978-0-416-92220-2. Knothe, Rainer (1997). Anhalter Bahnhof Entwicklung und Betrieb Zeugen und Zeugnisse aus über hundert Jahren. ISBN 978-3-88255-681-0. Maier, Helmut (1983). Berlin Anhalter Bahnhof. ISBN 978-3-88245-108-5. Alfred B. Gottwaldt (1994). Berlin, Anhalter Bahnhof. ISBN 978-3-87094-226-7. Peter G. Kliem (1984). Berlin Anhalter Bahnhof. ISBN 3-550-07964-8. Wikimedia Commons has media related to Berlin Anhalter Bahnhof. This page was last edited on 25 March 2019, at 18:56 (UTC).